Got a quick little anecdote for you guys! 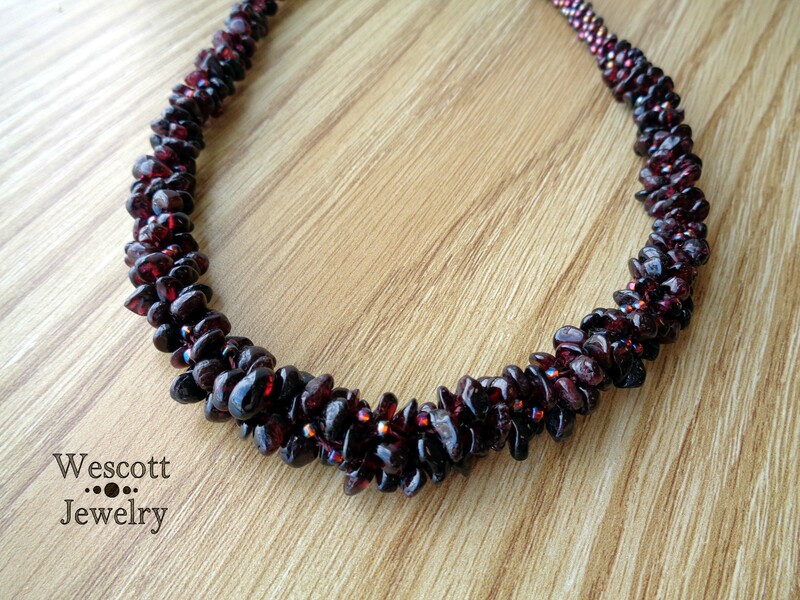 So, this week’s theme in the Year of Jewelry Project was Garnet, since it’s the birthstone for January. I was really excited about this theme, since I’ve had a bunch of pretty little garnet chips waiting mournfully in my stash for longer than I’d care to admit. 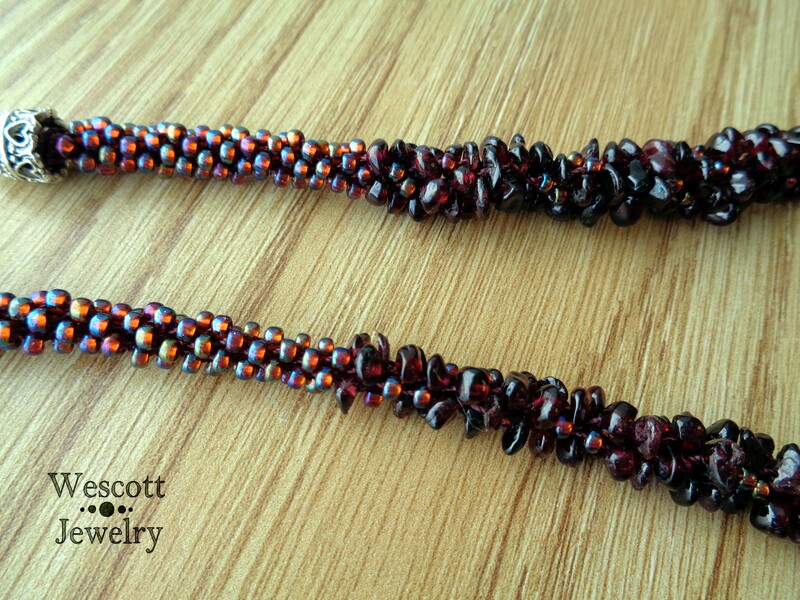 I decided to whip them up in a gently graduated Kumihimo necklace with some coordinating seed beads and leave it pretty simple – let the garnet speak for itself. I spent a good long time separating the chips into the appropriate piles for Kumihimo and trying to set them up so that they would graduate pleasantly in the finished product. This is kinda dull work, though, and to treat myself, I retrieved my unopened bottle of Glögg. Now, Glögg is generally a type of mulled wine, but the type that I had was a non-alcoholic gift from my mother. It was supposed to be heated up and enjoyed like a sort of liquid dessert, which I thought would be a nice addition to my tedious garnet counting. Turns out this particular brand of non-alcoholic Glögg is gross. Really gross. I whined to my husband that my desert liquid was gross and he suggested that I add something to it to mellow out the super-sweet, sugary lemon taste I was getting. Like any respectable 22-year-old with an impending deadline, I chose rum. Turns out this particular brand of non-alcoholic Glögg is much better when mixed with very alcoholic rum. Long story short, my innocent desert liquid became a kumihimo-destroying devil juice. You can actually see in the “finished” necklace where my tension began getting sloppy, as I proceeded to fill and refill and refill and refill my mug of previously non-alcoholic and now very alcoholic Glögg. I think the graduation turned out okay. But the tension was super uneven and sloppy, and the caps on the end look TERRIBLE. They aren’t even the right size! It’s obvious that I added those after a particularly high level of, uh, beverage consumption. It’s certainly not the worst piece I have ever made (boy, there have been some doozies), but it is definitely not up to my usual standards. 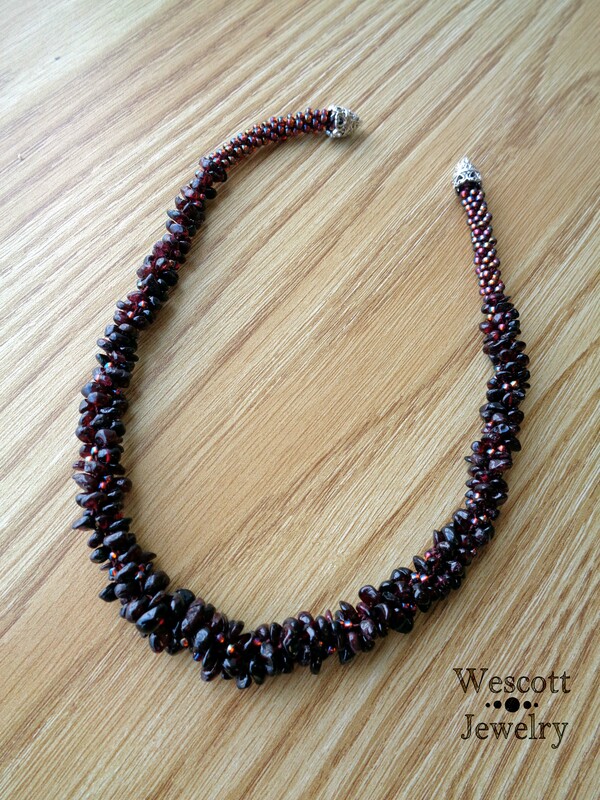 Unfortunately, I glued the necklace into the caps, so I will have to cut it apart to salvage the garnet chips. In the meantime, I went a completely different direction with my piece for the YOJP Week 2. I bezeled lavender Rivolis with gunmetal superduos and amethyst rondelles. It’s a pretty simple bezeling technique and works up quickly, but always looks nice. No, these are not in any way related to garnet, but the themes in YOJP are more inspirational than set in stone. 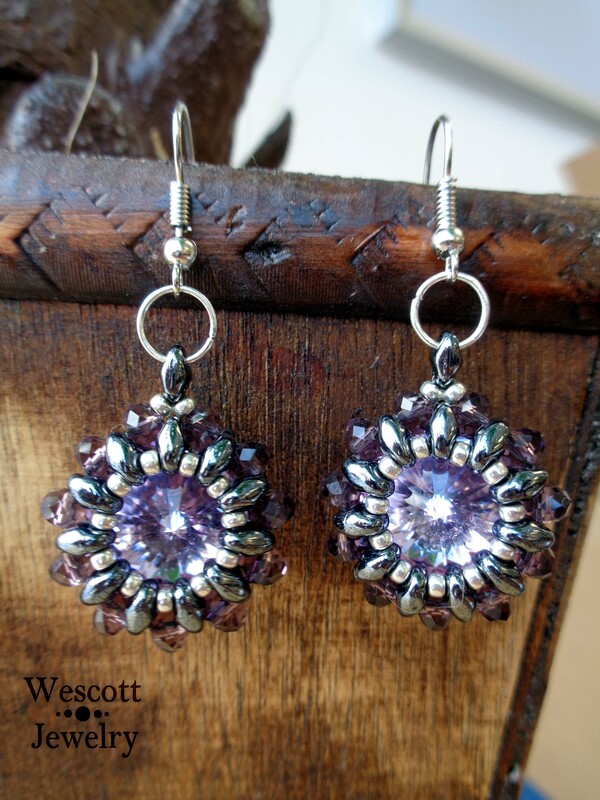 I really wanted to use those garnet chips, but I must admit – I really like these earrings a lot better. (Probably because I actually remember the process of making them). So, don’t drink and braid, kids. No matter how gross your Glögg is. 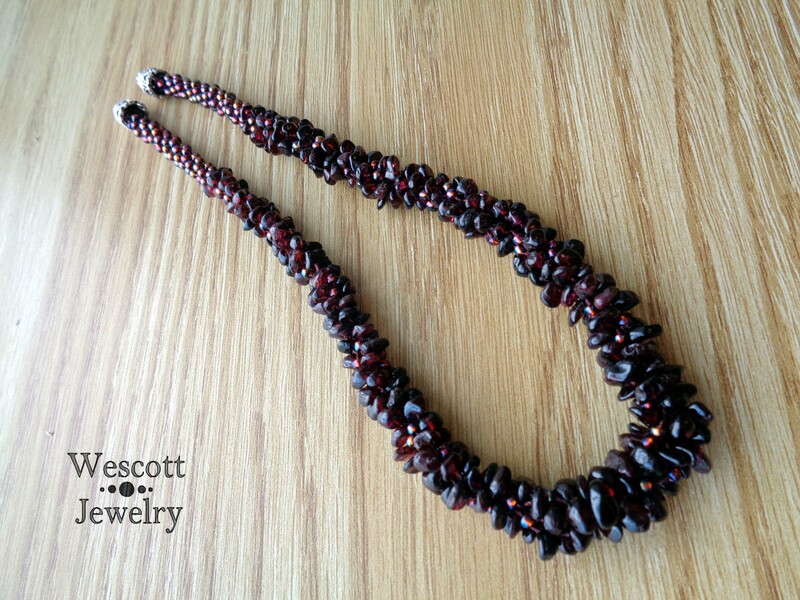 This entry was posted in Storytime and tagged beading, beads, beadweaving, beadwork, braiding, diy, drinking, drinking stories, facebook, garnet, Glögg, jewellry, jewelry, kumihimo, kumihimo braiding, mulled wine, year of jewelry, year of jewelry project, yojp. Bookmark the permalink. 2 Responses to Don’t Drink and Braid! You are too funny. I thought the necklace looked beautiful. You may need some Glogg when you take it apart. Looking forward to seeing the necklace without the Glogg. I love your patterns.